If you’ve ever read or watched anything about Area 51, you must have seen mention of the Area 51 camo dudes. 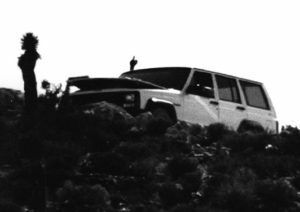 Named by Glenn “Psychospy” Campbell, a one-time Area 51 researcher, the camo dudes are the private security guards that patrol the 38,000 acres of land owned by the most famous secret base in the world. Campbell gave them the name because of the military-style camouflage clothes they always wear. If camo dudes catch you trespassing, you’ll find guns pointed at you. They’re authorized to kill you on sight, if they think it’s warranted. They are the Area 51 judges, jury, and executioners. 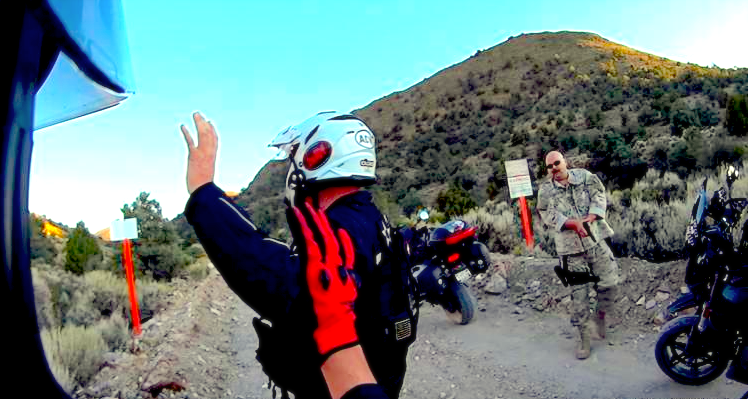 If you ever make a road trip to the Area 51 border, you may very well see some camo dudes—from a distance, anyway. 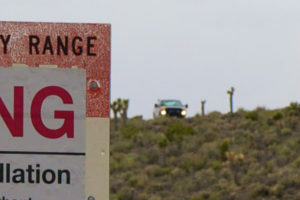 Their trucks are always out on patrol, and when you drive down the unmaintained dirt roads, you set off sensors that the Area 51 camo dudes monitor 24/7. They know you’re there before you’re anywhere near the official base border. And you might see a truck, maybe on one of the hills inside the border, just sitting there. They’re watching you, waiting for you to do something ill-advised and stupid—like setting foot on base property. The camo dudes are known for bothering people who are on the public side of the base border, even though members of the public are legally allowed to be there. They maintain sensors all over the public land, just to make sure they know who’s approaching the base’s land. Camo dudes are under orders not to approach civilians on public land, but that doesn’t stop them from spying on you or trying to intimidate you. Once apprehended trespassing on Area 51 base property, you will be handed over to the Lincoln County sheriff. He, too, takes a dim view of Area 51 tourists. “They’re there for pretty much one reason,” the sheriff, Kerry Lee, told the New York Daily News, speaking about tourists near the base border. “This is the middle of nowhere. It’s the middle of the desert. I see very few [trespasses] that are accidents,” he said. Glenn Campbell was an Area 51 investigator for years, going by the callsign “Psychospy”. He ran the Area 51 Research Center in nearby Rachel, Nevada, where he also lived. During that time, he had quite a few confrontations with camo dudes. Although he’s moved on, he visited the base in recent years and—just for old times’ sake—he antagonized some camo dudes he was spying on. See the video below, but don’t do this kind of thing yourself. Glenn’s a pro. How Do the Camo Dudes Spy on You? Camo dudes seem to have no shortage of equipment to spy on outsiders. They have long-range viewing devices and night-vision gear; their white pickups are equipped with monitors to keep tabs on the road sensors that monitor movement near the base borders, and, of course, they have radios. Being military contractors, you won’t be surprised to hear that many of the radio frequencies used by camo dudes are encrypted. Instead of voice communication, you’d just hear noise. In the 1990s, investigator Glenn Campbell reported in his Area 51 Viewer’s Guide that some of the camo dude frequencies were actually unencrypted. This may still be true. There is a lot of communications traffic in and around the Restricted Zone. 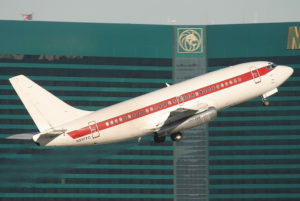 Air controllers talk to employee shuttle jets; security guards talk to other security guards; fighter pilots talk to each other and the ground. There has even been a rumor (although a bit of a stretch) that flying saucers at S-4 talk to the ground by radio. You may be able to hear some of this traffic if you bring a scanner radio, the kind that is popular today for listening to police and aircraft transmissions. This is a tool mostly for techies who have the time and patience to play around with frequencies, but there is a big potential payoff in better understanding the military activity in the area. Some sensitive channels may be scrambled or otherwise unreceivable, but many transmissions from inside the border are “in the clear” and can be easily picked up if you only know where to look. Where do the Camo Dudes Come From? Near as anyone can tell, Area 51 camo dudes are employed by Aecom Corporation, a large government contractor. (Aecom will neither confirm nor deny that they are the supplier of camo dudes to Area 51, but that’s to be expected. It’s known for sure that a corporation called EG&G Technical Services was the camo dudes’ employer at one point. Then, EG&G was acquired by URS Corporation, and after that, URS was acquired by Aecom. The New York Daily News says: “As of 2002, they were employed by URS Corporation, which was acquired by AECOM in 2014.”) G4S Secure Solutions (once called Wackenhut), another government security contractor, may also be a camo dude employer. What surprises many people—including us, when we first heard—is that camo dudes are not members of the U.S. military or the U.S. government. They’re merely glorified rent-a-cops, mall security guards wearing camouflage (and driving white pickup trucks instead of Segway scooters). Want to Become One of the Infamous Area 51 Camo Dudes? If you ever dreamed of being a cop with a secret mission, the occupation of camo dude might be the job for you. (By the way, we’ve seen no evidence of there being any camo chicks, but it doesn’t seem impossible that they exist.) It’s not usually very exciting: you spend most of your time sitting in a pickup truck, waiting and watching. On the other hand, sometimes it’s not boring at all, as this video demonstrates. The problem you’ll have actually scoring such a job is: where do you apply? 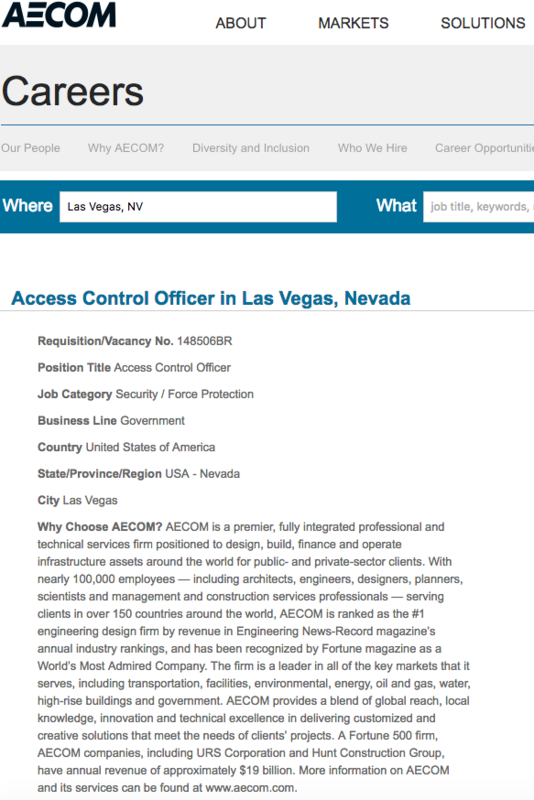 Aecom Corporation, the company we’re 90% sure is the primary camo dude employer, does have a jobs website. 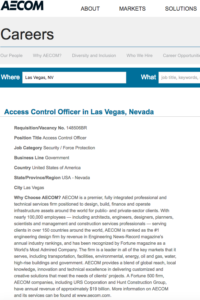 In a recent search of that site, we did find a suspicious-looking listing for an “access control office”, which sounds an awful lot like the official title for a camo dude. If you do manage to score a job interview, you’ll want to do some pre-interview research. Fortunately, study materials are available. 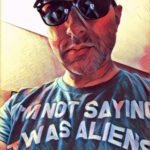 In the 1990s, an anonymous source sent Glenn Campbell and another Area 51 researcher, Mark “Agent X” Farmer, copies of the Groom Lake Security Manual, which has camo dude policy and procedure outlined in detail. Although it’s been on the Internet for years now—since Campbell first published it on his website in 1995—a lot of the basics are very likely the same. FOR SECURITY REASONS IF A CONTRACTOR IS ASKED WHERE HE/SHE WORKS, THEY WILL ANSWER “E.G. & G. AT THE TEST SITE”. THEN DECLINE FROM GIVING DETAILS. We do note that the language specifies the security guards as “he/she”. Maybe there are camo chicks after all.